We have all been acquinted with the fact that NASCAR's top series specialize in racing on paved surfaces. In fact, the series which is now known as the NASCAR Sprint Cup division hasn't run on a dirt track since 1969 won by Richard Petty. The ARCA Racing Series is a unique stock car tour which annually holds events on both paved and dirt tracks. 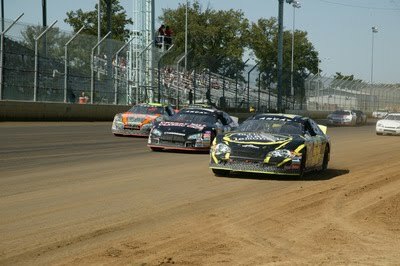 Running two dirt track races in total for 2010 in the state of Illinios, this offers a truly special opportunity for full-bodied stock cars to jockey on looser surfaces. With the first race transpired at the Illinois State Fairground two weeks ago in Springfield, the second of the dirt oval races was being held on Labour Day Monday at the DuQuoin State Fairground. The green flag dropped for the Southern Illinois 100, 33 Starters led by the #10 Ford of AJ Fike flew across the start line entering into what would be a very tense outing for many competitors. Fike would stay out front for the first 16 circuits around the 1-mile DuQuoin dirt oval until he lost the lead to local driver Kelly Kovski. Losing the led, AJ Fike's day which started with a Menards Pole award ends due to the ill-effects of an engine failure to the #10 car. Spending 14 laps out front in the #17 Chevrolet Kovski, who regularly serves as a Car Chief for another driver, retained the top spot until he pitted ahead of lap 31. By pitting, former long-time NASCAR Sprint Cup mainstay Ken Schrader took the lead of the 100 lap. Schrader's appearance at the front of the race would be relatively short-lived as ARCA overall points contender Tom Hessert overhauled the Federated Chevrolet on lap 37. Harking back to the tensity of the Southern Illinois 100, drivers would have to survive 11 cautions within the 100 lap event. This was significant for Hessert's effort in the #77 dodge as he wanted a long, green flag to separate him from the rest of the field. Through the multiple yellow flags, this was not going to happen for Tom Hessert. As Hessert led, Venturini Motorsport driver and Canadian Steve Arpin found the strength in his #55 Mike's Hard Lemonade Chevy was on short runs. Meaning, once Arpin climbed to second, the #77 Dodge was in his sights. On lap 62, Fort Frances, Ontario native Steve Arpin pulled off the race-winning pass going in to lead the final 39 laps around the 1-mile dirt track. 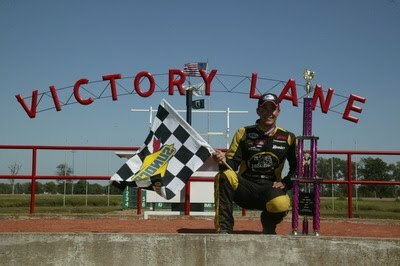 Having previously scored pole at the Illinois State Fairground ARCA race, Arpin's championship-winning background on dirt tracks made this event the obvious location for breaking a 5-month ARCA Racing Series winless streak. Tom Hessert gave Arpin an honest fight up to the checkered flag but finished 1/2 a second behind. Hessert's finish two positions ahead of Patrick Sheltra (point leader heading into the event) has resulted in a tie at the top of the ARCA Racing Series point standings. Steve Arpin's Venturini Motorsport teammate Mikey Kile finished 3rd which allowed the driver to elevate himself to 5th in the points. Ken Schrader placed 5th in the Southern Illinois 100 at DuQuoin ahead of Will Kimmel, Craig Goess, Chad McCumbee, Kelly Kovski and Bryan Silas who made up the remainder of the race's top-10 finishers. TSN Gives Auto Racing the Back Seat Again!